Registration is now open for Interfaces. This multidisciplinary research training event examines questions of mediation and memory in encounters with non-textual archival materials in the arts. 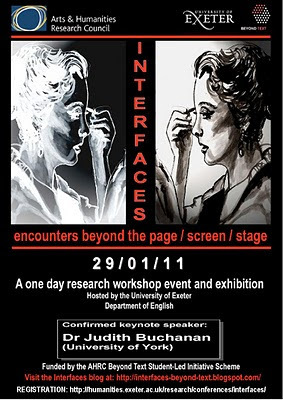 By creating dialogues between presenting postgraduates and experienced researchers, the event seeks to investigate issues that take the researcher beyond the text in the use of objects and artefacts that constitute non-textual interfaces between film, literature and theatre. The event features five core workshops on the following panel themes: Performativity / Beyond Screen / Forms of Engagement / Digital cultures / Rethinking Archives. Participating delegates are invited to attend two central parallel workshop events in the University’s Bill Douglas Centre for the History of Cinema and Popular Culture and Exeter’s Special Collections, where hands-on explorations of key filmic, theatrical and literary non-textual materials will be led by the curators of these archives. The Interfaces Exhibition also accompanies the event, showcasing Beyond Text materials and artwork from participating delegates. Please direct all enquires to Lisa (lrs204@ex.ac.uk.